One of the most versatile evergreen varieties, Magnolia grandiflora ‘Little Gem’ has been used as a hedge or landscaping plant in Australia for many years. Available for sale from a number of wholesale nurseries in sizes from 1m to 3m. 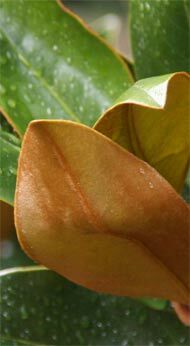 Valued by landscapers for it’s foliage, the glossy green foliage contrasted with the fealty copper underside of the leaves make it a great plant to add interest to a screen or for hedging. Also used as a specimen plant but growing equally well in pots or containers. Much talk about this being a ‘dwarf’ evergreen magnolia. In the right conditions it will reach over 5 meters, however in cooler areas 3m is more usual, so maybe a ‘small growing’ magnolia. With a spread of 1.5 – 2.5 m try planting at 2m centers for hedging. In terms of actual growth rate we would describe it as moderate, however this will depend on the soil aspect and climate. In warmer climates (Sydney and North) it will be faster than in cooler areas. Flowers appear in spring to summer and are white, slightly fragrant and attractive, however if it’s really spectacular flowers you are after maybe this is not the right magnolia. This is a fairly tough plant once established and if you can provide a cool root run and a little protection from extreme temperature and hot winds it requires little care. Fertilization is best carried out in spring, water well before fertilizing with a general purpose slow release type. Look for a soil pH of around 5 to 5.5, use a liquid seaweed solution to water in when planting. This is a plant that holds its shape well and actually requires little pruning at all. However it easily pruned to form a hedge , and tip pruning after flowering will help promote a bushy habit. Of course any dead wood can be removed or required shaping can be carried out. The root system is fairly wide spreading, reaching well out from the tree itself. The roots are ‘unbranched’, they are also fairly shallow rooted, and this makes them a little difficult to transplant once established, take a large rootball (wide) if you decide to shift them.